Borsch is perhaps one of the most famous dishes in Russian cuisine. It is considered the national dish in Poland, and Russia, and Lithuania, and Romania, and Belarus and Ukraine. Borsch is known from 14 – 15th centuries in Russia, it was mentioned in the monuments of 16-17th centuries and books of 1586-1631. The consequence of all this is a lot of ways to cook it. Probably almost every family has its own recipe for cooking this soup. 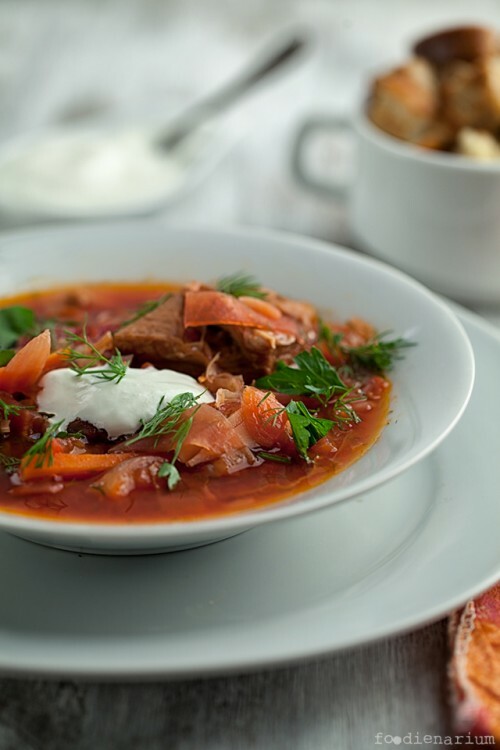 Borsch is a multi-component filling soup and many people think that it is difficult to cook. But it’s not! At least the recipe that you will see below is quite simple in general. I think it is kind of a mix of how they cook this soup on the Don, where I live, and in the Ukraine. Pour of 3.5 liters of cold water into a pot. Put the meat cut into small pieces inside and put the pot on the stove. Bring water to boiling removing the foam. Then throw 2-3 bay leaves, a handful of peppercorns, parsley stems, and a little salt. If you want, add some more spices. Boil broth for an hour and a half. The meat should be very soft and easily separate from the bones. When the broth is ready – pull the root of parsley and the bay leaf out of it. Add the beans and cook over the medium heat for 15-20 minutes. The beans must stay a little bit damp. Now add the chopped carrot, 1 onion and bell pepper. Also add chopped garlic cloves and cook for 10-15 minutes. Clean and cut the beets into small pieces. Add it to the soup, stir and cook for another 10 minutes. Then add potatoes chopped into large cubes. While the potatoes are being cooked (for about 15 minutes), fry the second head of chopped onion in vegetable oil until it’s golden, add the chopped parsnips, tomatoes, tomato paste and 1 tablespoon of sugar. Fry for some more time and it’s ready. When the potatoes are soft, add the chopped cabbage and cook for no more than 5 minutes. Then add the onions, parsnips, tomatoes and chopped parsley. Turn off the stove and leave borsch for 30 minutes. Serve the soup with sour cream and chopped parsley (or maybe dill), and of course with a few slices of bread or fresh dried toasts.